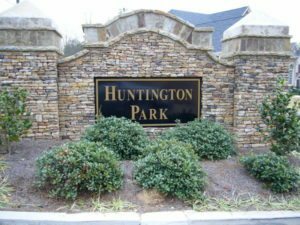 We recently visited Huntington Park subdivision in northwest Cobb County, Georgia. These homes range in price from the $400’s – $600’s+. The homes had loads of great details inside and out. The lot sizes ranged from around 1/3-3/4 acre and were primarily on mildly rolling terrain. They are located on beautiful, wooded acreage to say the least. It’s a shame to see these old homesteads turn into subdivisions, one by one, but free choices are made and progress marches on. We never tire of seeing what home builders will do with a kitchen. This particular weekend provided a little extra surprise with this particular house where they featured all stainless steel Jenn-Air appliances throughout the kitchen, granite counter-tops, stone tile back-splashes, a desk and beautiful cabinetry, including a walk-in pantry. Now that’s cool! 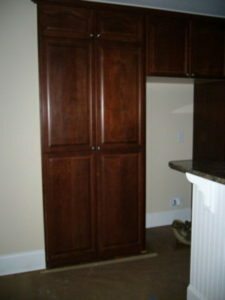 You’d never know that a walk-in pantry was hidden behind the cabinet doors by the looks of it. This was pretty darn close to how I’d put a kitchen together if given the opportunity. My preferences lean toward a medium-sized kitchen for maximum efficiency that includes durable appliances. This kitchen had it! I’m no chef, but I like to cook, and having the right tools for the job is mandatory, although improvisation comes into play quite often during the cooking experience. That’s another topic altogether. The orientation of the kitchen, in relation to the living room area, within the home is particularly important for those that entertain guests on a regular basis but it is a really nice feature for busy families, as well. It’s nice to be able to come home from work and prepare a meal and not feel cooped up, while the rest of the family may be winding down in another area of the home. This home has an efficient work area and has a very clear view of the keeping room over a raised, open counter that is open on both ends and comprised of deep, dual stainless sinks. Standing at the sink you can enjoy the company of others while preparing dinner or drinks. There is a nice-sized breakfast room located on the right and the keeping room with fireplace located on the left. There is also a built-in desk and an island for a little extra counter space. Very nice overall design! There is a Jenn-Air countertop gas range with 6 burners with cast iron grates that should keep any cook happy and make the cooking process as efficient as possible. 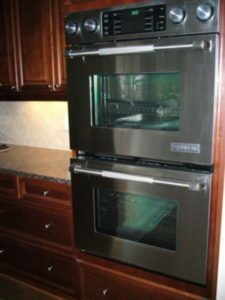 A Jenn-Air dual convection wall oven is also included in this gourmet kitchen. 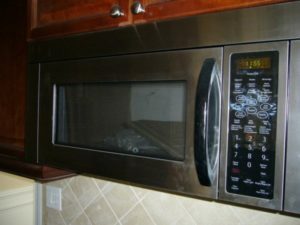 And, of course, there is a Jenn-Air microwave oven located above the gas range. 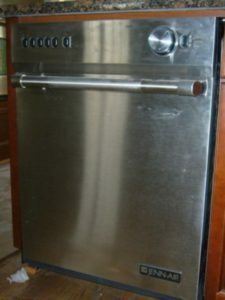 When dinner is done and everyone’s belly is happy then it’s time to throw the dirty dishes in the Jenn-Air stainless steel dishwasher. Hardwood floors in kitchens seem to have taken off in recent years due to advances in the resiliency of finishes. We have hardwood floors in our kitchen and are very pleased with the look, feel and investment aspects of having had them installed. This home had oak hardwood flooring installed that was stained as a natural compliment to the cabinetry. The 9 ft. ceilings will allow a homeowner to put a great looking pot rack over the island if they so desire. It also lends a very open feel to the entire area. The keeping room off of the kitchen has a vaulted ceiling with bead board installed on the ceiling itself. That’s a nice feature that you don’t see everyday. This is truly a kitchen that you can work in and enjoy preparing meals for friends and family. Read my review on the rest of this great home in Huntington Park. Writing a home building blog that chronicles new homes during different phases of construction from a consumers’ point-of-view is rather unique and loads of fun. Basically, my tips are a collection of checklists for what I think should (and should not) go into building a quality home. So let’s have fun seeing what’s new in the housing market these days! Stay up to date with what's happening on The Homebuilding & Remodeling Guide. From Interior and Exterior Home Decor & Maintenance to Building Basics, Styles & Trends... you'll always be the first to see these helpful tips as soon as we publish a new article.